14 th of November is a date etched in all our hearts. Everyone in the country celebrates it as children’s day on the occasion of Pandit Jawaharlal Nehru’s birthday. But have you thought of planning a special children’s day for your kids? The day is just around the corner and there isn’t much time left. So if you still don’t have a plan in place, let me share 10 Ideas & Gifts for your adorable Munchkins for this day. Compiling a list of 10 Ways to make a Special Children’s Day for your Kids, for all the ones who are yet to plan one! A vacation or even a weekend Getaway to a nearby resort can be a refreshing break for your family, your kids and for you! Go ahead an Plan one on behalf of everyone and have a ball on their special Children’s day! Living in today’s world doesn’t get more exciting. With the range of Toys available for kids, it is really engaging and educating at the same time. With a wide range of toys from educational toys, augmented reality toys, or just some random toys for time kill – the market is loaded with options. Brands like Skola, Shumee, Playshifu, Gelmags are some of the leads where you may want to start. Or you can go to any of your favorite children’s shopping website and make good use of the ongoing discounts and make a decent purchase. Awesome toys are boun dto make it a special childrens day for your kids. Got a local Museum you have been meaning to take your kids too? Or a play area where your kid and his friends could jump in and kill some time? Stopping procrastinating it for another time because Children’s day seems like the best opportunity to fulfill these wishes they have been making for a while. You can also give them some pool or a water park experience as kids love splashing in the water. Have an order of your books reach you on Children’s day or even before. Gift wrap them in layers of newspapers (just to increase the anxiety of knowing their gift) and give a gift of knowledge to your little ones. Reading is not just a great habit to develop, but also opens the windows of the minds to new and interesting information. Need we elaborate more? Whether you plan to have a special childrens day, or just go through an ordinary day – books are your forever best friends. Rent a dress or buy it – if your kids are over toddler age (and some even below toddler age kids) they can never swoon enough over superhero & Princess’s outfits. Whether you choose to celebrate with just your kids, or if you make a better plan of having their friends join over for a little party – you can make their day simply by a little make-believe. If you plan this, trust me – they are going to have a crazy awesome memorable day! Ordering party themed supplies, party themed cakes or return gifts – the choices are endless. Seems highly unlikely? But if your child is well above a certain age to understand the gift of a live pet – children’s day may be a great day for the purpose. From a dog being a man’s best friend to seeing the musings of kittie cat – a pet can completely change the way your lives have been forever. The day your pet walks in to your home would be the most special childrens day for your kids. If you already have a pet at home, there’s always room for more, no? #4. Cheat Day on your special children’s day! Who does not like a cheat day? Parents, or kids – everyone likes to do whatever they will too, without any rules implicated on them. Good enough TV or mobile phone timing, or allowed to eat junk or chocolates – are all allowed on cheat day. For just one day, let them go wild and choose whatever they may call it celebratory. When you talk about chocolates, the first thing that comes to your mind is Cadburys! One Cadbury bar or a whole mountain of it, you can never have enough of it! Kids, parents, and people across all age groups will agree to this. Have you checked out their new TVC? Nothing is more valuable to a child than some quality time they seek from their parents. Sometimes, no activity at all, but just cuddling for some time makes the day! Consider children’s day as one more such activity and strive to spend quality time with your kids. No matter what activity you plan to do with them, completely join them and stop being a parent for one day. The best way to have fun or let your kids have fun is by being a kid with them too!! Bachon ke saath, bacche ban jaaye… that is when you will experience real fun! This Children’s Day give a special treat, not just to your kid but also to the kid inside you and plan along to have the most special children’s day ever!! Do let me know which of these ways did you utilize. If you liked this article, don’t forget to SHARE it ahead. You may also like to read 7 First Birthday Party Mistakes Parents Make & How to Avoid Them. Loved reading all these fantastic ideas for celebrating children’s day. I like that cheat day idea the most. I think kids love to do what they want actually in that special day. So let them enjoy the way they want. I like the Superman and Elsa idea. Kids love to see their superheroes come to life. My cousin’s hubby does it for their girl and she always squeals in delight. I just love the ideas you gave here. Specially the one of having an inhouse themed party. I’m sure my girls would love it. 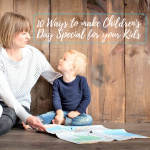 Really great ideas for an amazing children’s day. Lovely ideas Prisha. Childrens Day is indeed time of the year when you can make your child feel all the more special and loved. What better than giving them there favorite cartoon characters to wear. My daughter loved Doaremon and we are also planing to get her the dress on rent and make her wear for a photo-shoot session. These are Amazing Ideas for Children’s Day. I love you described everything in detail ! Love all the ideas you have shared here but like most the last one ‘bacho k saath bache ban jao’.. It is very necessary sometime to bring out the small kid inside us and become like kid… Lovely post. This is such a lovely list of gifting ideas for kids to celebrate Children’s Day in style.